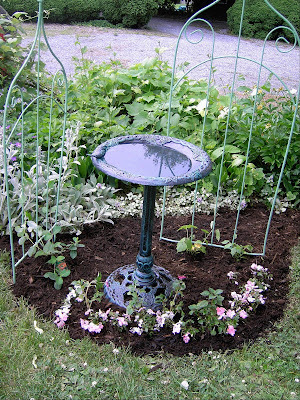 While some might say the economy is sluggish, we’ve seen just the opposite here at The Artist’s Inn. In fact, this Spring saw more rooms filled than ever. 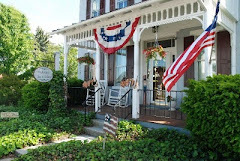 As couples make their way back every spring to their favorite spot, we’ve had to add additional rooms….outside the inn. I guess by now you’ve figured out that we are talking about our feathered friends. 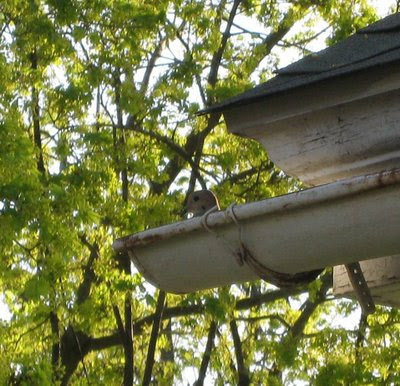 For years, a mourning dove has made her nest in the gutter above the old summer kitchen. No matter how hard the rain runs off the roof and onto her head, she is there protecting her nest. One year I was lucky enough to catch the first flight of her little ones as I looked out the window of the Garden Suite. 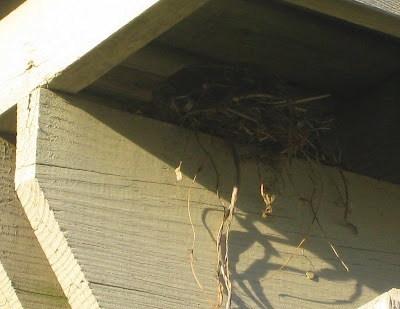 If you’ve visited in Spring and thought that the porches were a bit untidy, it was probably due to the annual nests that are built high and safe above the front porch lights and the outdoor speaker on the side porch. Two new nests appeared this year – in the middle of the flowering pear tree just outside the Kriss Kringle Room, and in the lilac tree just off the side porch. The eggs were blue, so our guess is that it was a robin’s nest. I’ve noticed that the birds also set up residence in our Carriage House, under the back deck. From the sounds in the early morning, it’s fair to say that I think we have a pretty happy feathered crew. There are the two sets of cardinals that visit in the early evening, the hummingbirds that are drawn to the bright flowers, the mockingbird high atop the Carriage House, and the finches that love to bathe in the bird bath. 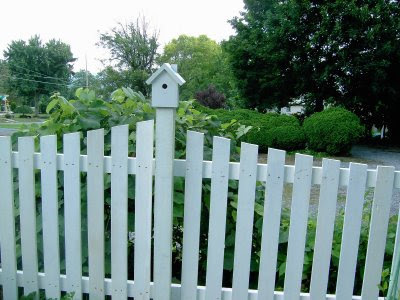 The small wrens have it made – their homes are the small white birdhouses that sit atop our fence in the back yard. It’s nice to know that not only do we provide a respite for humans, but also for our feathered friends as well. 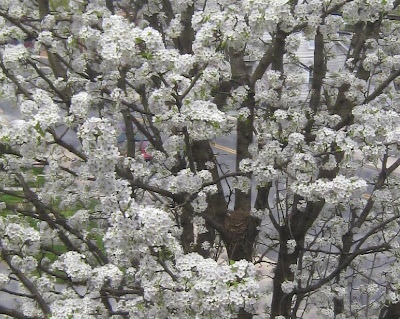 They reward us with their song and beauty from May through October.